Today is a sad day for Atlanta Braves fans and baseball fans everywhere. Long-time Atlanta Braves broadcaster, Skip Caray, passed away following a long illness. As a huge Braves fan since we got WTBS in 1981, I feel like I have a close personal relationship with Skip as the voice of the Braves throughout the lean years (that's an understatement!) of the mid-late 1980's. 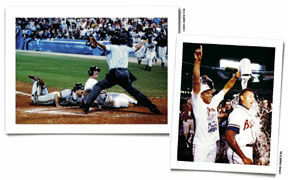 Then Skip shared in the joy of the magical worst-to-first season of 1991 with Braves fans everywhere. 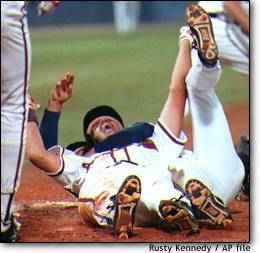 My favorite all-time memory though has to be the winning play of the 1992 National League Championship Series when "Sid slid" and beat the throw from Barry Bonds to win Game 7 versus the Pirates. Swung, line drive left field! One run is in! Here comes Bream! Here's the throw to the plate! He is...SAFE! Braves win! Braves win! Braves win! Braves win!...Braves win!!! I'll never forget that night of euphoria, and Skip Caray is a big reason why. Thanks for the memories Skip. You will be greatly missed.